The history of castle apartments before Second World War I would like to begin with the description of the west wing. From first to third floor there was a Castle Chapel, with was added to the west wing of the castle in 1592. In that chapel several hundred years later were crowned kings of Prussia. 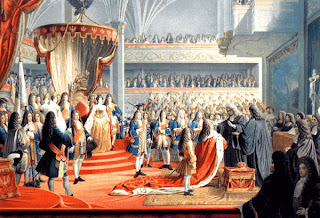 In 1701 in the castle church was coronation of Prussian first king Frederic I. Paintings and chronicles keep details event. King and queen were wearied celebratory dresses. 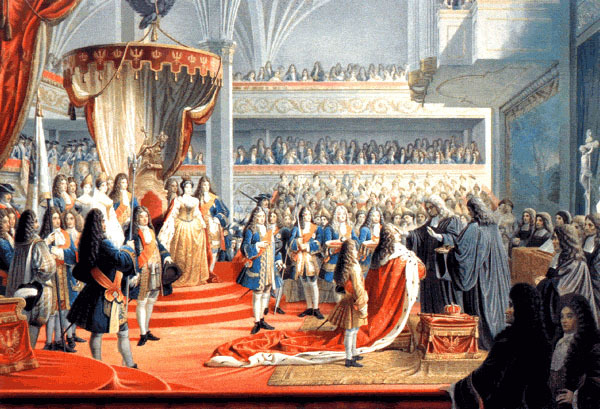 24 trumpeters, drummers and 60 aristocrats took of this grant part in the coronation ceremony. What is interesting is that queen was rebuked by her royal husband that she took a pinch of snuff during ceremony. Unfortunately, all decoration was burnt under bombings of Englishmen during the Second World War. In the chapel was also located famous Moscowiter –Saal, named in honor of Russian delegation. It was one of the biggest halls in the 19 century Germany - 83 m long and 18 m wide. 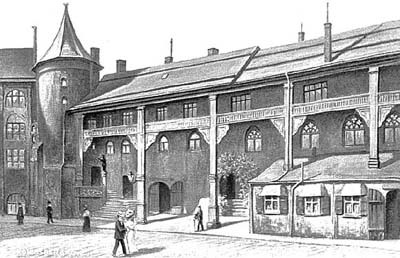 Curiously, that the arch of Moscowiter –Saal was built without any columns. 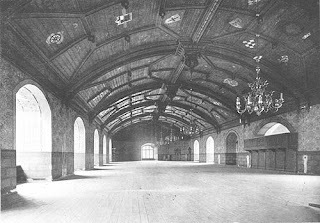 The Saal was famous with its collection of trophies which belong to the Museum called “Prussia”. The castle walls and columns were decorated with arms with Oder symbolic black eagle. The mechanical elevators transported barrels of wine into the cellar. The old castle also had perfectly constructed heating system. In the basement of the castle was located wine tavern “Blutgericht”. 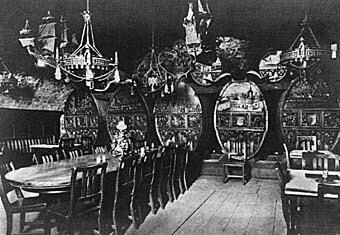 The restaurant was decorated by wood and metal in the knight’s style. In translation it means “Bloody justice”, because in ХVII century at this place there was a prison. The story of the Blutgerichtis is interesting and goes to the old legend about the clever Konegsberger who escaped the death execution drinking red wine together with his security in the tavern. One of the legends goes to tavern of Blutgeriht, located in the cells of the castle. One day procession with the person, convicted to the death passed near the castle. The judge was marching the first, followed by executioner, prisoner, and two guards. The Prisoner’s name was Hazuveit. He killed noble person and was convicted to the gallows execution. Near Konigsberg Castle, he reminded to his executioners about his right for the last wish. He asked to visit tavern Blutgericht and to drink his last glass of wine. The judge didn`t mind, and all procession stepped down into the restaurant. Hazuveit drank his wine accompanied with the team of his assassins. The red wine and nice atmosphere of the restaurant put them in a good spirit and soon they all looked like a friends having a party. Nobody stopped Hazuvet, when he asked his new friends to visit washroom. And long time passed before drunken executioners realized that prisoner disappeared. They tried to look for the Hazuveit and come to the gallows square guessing that their victims wait for them near with the place of execution. People on the square, who were waiting for death penalty demonstration, were laughing hard, looking on the foolish execution procession without prisoner. They were cackled and were making fun of executioners while they tried to find the prisoner near the gallows. The sort of red wine what was sold there had the same name. South wing. In Wirzburger Tower there was a cabinet of the museum director Vilgelm Gerte. Between Wirzburger Tower and Grubers Tower were created six museum apartments, in the basements of the south wing the part of archeological collection was stored. 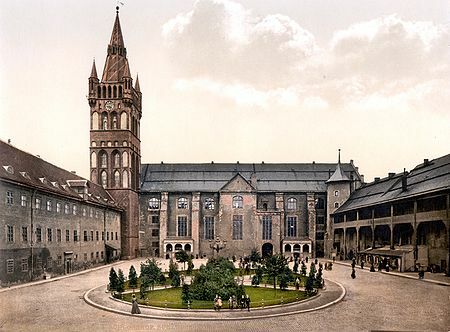 Until the latter part of World War II, the apartments of the Hohenzollerns and the Prussia Museum (north wing) were open to the public daily. Among other things, the museum accommodated 240,000 exhibits of the Prussian collection, a collection of the state and university library as well as many paintings by the artist Lovis Corinth. During World War II, various pieces of captured Russian art were stored there, possibly including parts of the Amber Room. An extensive collection of provincial archives was also housed there. Also the Blutgericht, a wine selling tavern, was situated within the castle. Following the bombing of Königsberg by the Royal Air Force in the Second World War in 1944, the castle completely burnt down. However, the thick walls were able to withstand both the aerial bombing and Soviet Artillery, as well as urban fighting in April 1945, allowing the ruins of the castle to stay standing. The largely demolished Königsberg became part of the Soviet Union and was renamed Kaliningrad in 1946. 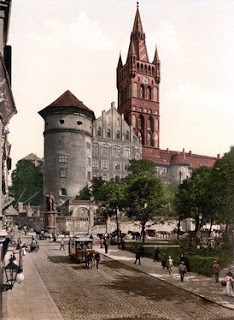 Kaliningrad was to be rebuilt as a model town on the remains of Königsberg, without a reminder of the German past left standing. Leonid Brezhnev consequently ordered that the remains of the castle be disposed of so they would no longer be seen as a vestige of Prussian militarism in the eyes of the Soviet Government. Despite protests from students and intellectuals from Kaliningrad, the ruins of the castle were destroyed in 1968. Many interesting thing were found by the archeologist during the excavation. One of the most attractive is a small silver case filled with eleven items - amulets, medallions and ring all marked with magic symbols. The ring was attached to the silver case with an iron lock. According to the chairmen of the Baltic expedition of the Archeology Institute, ring had a ghost-protecting use and finding may be dated the 16th century. Also collection of old wine was found as was a secret underground tunnel.